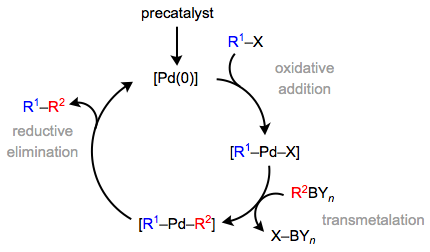 The Suzuki-Miyaura reaction involves the palladium-catalyzed cross-coupling of an electrophilic halide or pseudohalide with a nucleophilic organoboron compound. Traditionally, boronic acids have been used as nucleophiles in this reaction; however, many boronic acids suffer from problems associated with protodeboronation and instability. Potassium trifluoroborate (TFB) salts can mitigate these issues by serving as stable, protected forms of boronic acids. In the presence of protic solvent and base, TFBs are slowly hydrolyzed, forming boronic acids active in cross-coupling. A wide variety of TFBs have been prepared and used successfully in cross-coupling reactions (Eq. 1). Potassium trifluoroborate salts may be synthesized straightforwardly from the corresponding boronic acids (and other organoboron derivatives) by treatment with KHF2. Their straightforward synthesis, functional group tolerance, ease of handling, and enhanced stability relative to boronic acids have made TFBs popular nucleophiles for cross-coupling reactions. Aryl TFBs are the most common class of nucleophile employed in these reactions. Virtually all substitution patterns and all manner of electron-donating and -withdrawing substituents have been successfully incorporated into aryl TFBs, although sterically hindered substrates with ortho substitution often react sluggishly. While electron-poor aryl and heteroaryl boronic acids are often subject to protodeboronation, aryl TFBs with electron-withdrawing substituents (and TFBs in general) are resistant to this problematic side reaction (Eq. 6). Aryl halides and pseudohalides are very commonly used as electrophiles in couplings with TFBs. Aryl iodides are the most reactive substrates, followed by bromides and chlorides. As a general caveat, conditions developed for less reactive electrophiles (such as aryl chlorides) are rarely also suitable for more reactive electrophiles (such as aryl iodides). This is because changing the nature of the electrophile may change the turnover-limiting step of the reaction. Furthermore, substrates containing both bromides and triflates may suffer from selectivity issues resulting in diminished yields (Eq. 12). Among alkenyl electrophiles, alkenyl bromides are most commonly employed (Eq. 13). In general, the scope of alkenyl electrophiles is lower than that of aryl electrophiles. For example, alkenyl chlorides have not yet been employed successfully in cross-coupling with TFBs. In general, reactions should be carried out under inert atmosphere. For all but the most reactive of electrophiles, elevated temperatures are required. The use of palladium(II) precatalysts is preferred to palladium(0) catalysts, as the latter are unstable in air. For very simple substrates, ligandless conditions can be employed, but most substrates require either chelating phosphine ligands or bulky, monodentate phosphines. A hydroxylic solvent or cosolvent is necessary to facilitate transmetalation from the trifluoroborate; consequently, reaction mixtures often begin as heterogeneous but become homogenous as the reaction proceeds. Deoxygenated solvents are recommended to prevent oxidation of the catalyst and ligand. The most common bases employed are carbonates (in non-polar solvents) and amine bases (in protic solvents). ↑ Denmark, S. E.; Ober, M. H. Aldrichimica Acta 2003, 36, 75.